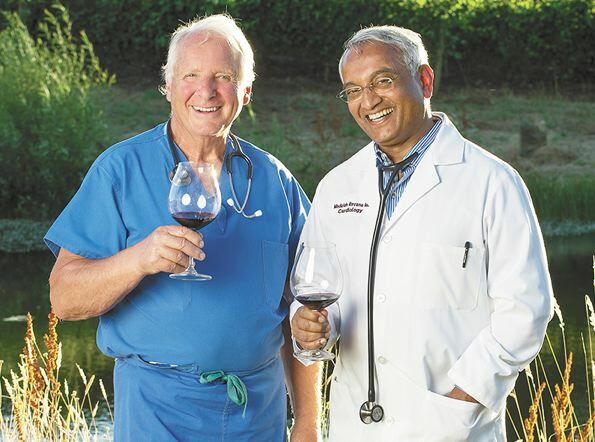 Dr. Medaiah Revana, proprietor of Alexana Winery, was one of the featured Oregon physicians in the November 2014 article I wrote for Oregon Wine Press: “Prescription for Pinot: Doctors Take Up Residency Among Oregon’s Noble Red,” www.oregonwinepress.com/doctors-prescription-pinotoregon- wine. The cover of that issue features a photo by Andrea Johnson of Drs. John O. Bergström (left) and Madiaiah Revana. Dr. Revana grew up in rural India near Bangalore where his family has been farming for generations and this farming heritage led to his instinct for winegrowing. He graduated first in his class from Mysore Medical College in India and became board certified in cardiology and internal medicine after serving his residency and fellowship in the United States. Dr. Revana was first introduced to wine by friends and became fascinated with Bordeaux’s first growths while practicing cardiology in Houston, Texas. He traveled to the wine regions of Europe and the United States, and became determined to establish a world class vineyard estate. In 1997, on a visit to the Napa Valley, he found a small parcel of prime vineyard land in St. Helena. In 1998, he hired vineyard manager Jim Barbour to plant and maintain a 9-acre vineyard, and started Revana Family Vineyard, releasing the first vintage in 2001. Noted winemaker Heidi Barrett was the initial winemaker and later Thomas Rivers Brown. As many wine connoisseurs do, Dr. Revana developed a love of great Burgundy wines as well. After enlisting the assistance of noted Oregon winemaker Lynn Penner-Ash of Penner-Ash Wines (I jokingly refer to her as Lynn Pennoir-Ash), he acquired 80 acres of vineyard land in the Dundee Hills appellation in 2005, and started Alexana Winery, named after his daughter, Alexander Revana. An additional 39 acres of Pinot Noir, Riesling and Chardonnay were later added to the existing 16 acres of Pinot Noir and Pinot Gris. Today, the Revana Vineyard, which has an unusually complex diversity of soils (18 different types) and exposures, has grown to over 55 acres. There are 10 clones of Pinot Noir planted. The annual production of 5,000 cases is now directed by Penner-Ash with assistance from winemaker Bryan Weil. A tasting room in a LEED Certified Gold facility is located on NE Worden Hill Road in Newberg and is open daily. 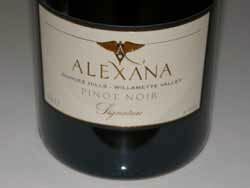 The wines are also sold on the website at www.alexanawinery.com. The winery offered 4 Pinot Noirs in 2012: Revana Vineyard Pinot Noir ($48), Signature Pinot Noir (favorite 10 barrels of Pinot Noir from 2012 vintage, $75, sold out), Black Label Pinot Noir (a wine club members exclusive, $95), and Best Block Pinot Noir (produced from the finest block of Pinot Noir fruit in the estate from the 2012 vintage, 120 cases, $125). Magnums and double magnums are available. Chardonnay, Pinot Gris and Riesling are also offered.